St-Patrick's celebration was not based on the symbolic green this time around. Instead, dedicated brothers are honoured with their passion for ice-cream creations. Just how far did I go for my inspiration to please my love of coffee and chocolate? Across the continent to Ireland to grab the formula for a lusciously, delicious, decadent flavour. their version of a popular Espresso-Kahlua-Chocolate flavoured frozen treat. After working this one out, all I can say is...you gotta make this one. A definite addition to my ice-cream repertoire...and one you'll not want to put off trying. opened its doors in the coastal town of Dingle, Kerry county, Ireland. Now, with other locations in: Killarney and Dublin as well. Keiran, born in New York, now lives and runs shop with his brother Sean. charming ice-cream shop has delighted ice-cream lovers from all over the world. From Honey Lavender Cream to Mulled Wine Sorbet...their ice-cream recipes are wide-ranging. In addition, they've been generous to share most of them with us from their blog and book as well. These adventurously passionate brothers set out to create the best ice-cream in the world. Their philosophy on preserving natural ingredients is one I admire and duplicate in my recipes. In fact, they are so obsessed that they collect sea water to make their sea salt ice-cream flavour. Another reason their ice-cream is so wonderful is because of milk taken from their local 'Kerry cow'. I'm certain my Quebec cow should produce something fairly close..."n'est-ce-pas my dear"? Therefore, here I went with the original and then made it my own. I also proceeded very differently in the preparation process. Yes, once more, I had the pleasure and satisfaction of do it machine-free. However, don't let my traditional way stop you from revving up your handy ice-cream machine. 1. Coarsely chop the chocolate and set aside to later be added to the custard. 2. Espresso syrup: In a small saucepan, pour espresso, coffee powder and sugar. Heat together on medium-high until the liquid reaches a gentle boil. Afterwards, lower the heat to medium-low and cook the syrup for about 10 minutes as it reduces by 1/3. No need to stir. This will render a smooth, concentrated syrup. Remove it from the heat to cool off. 3. 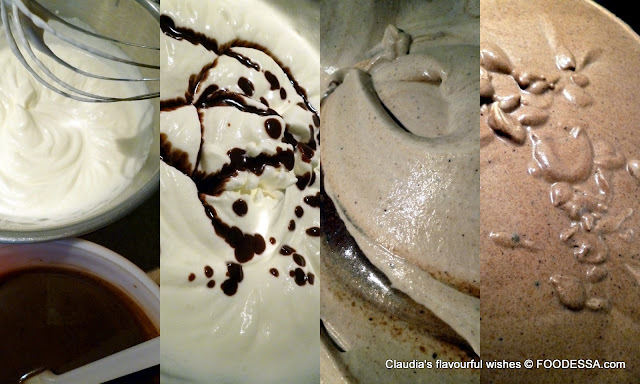 Cream custard: While the Espresso syrup is reducing, assemble the ingredients for the custard. In another medium saucepan, whisk together the egg yolks and sugar. Gradually whisk in an initial small portion of the milk. After whisking this as well, add the rest of the milk. 4. On the same heating burner of the Espresso syrup, swap out the saucepan and replace it with the custard mix saucepan. Start whisking the mix whisking constantly on medium-high for a few minutes until a thickening begins. At this point, immediately close the heat and remove to set it aside. 5. Chocolate- Espresso - Custard: Whisk in the above Espresso syrup as well as melting in the chocolate chunks into the custard. After 10 minutes, transfer the custard into a medium bowl and cover with a plastic wrap touching the surface. Leave it for about 90 minutes to reach room temperature. Add the Kahlua liquor only when cream has cooled. 6. Assembly with Whipped cream: After having placed a large stainless steel bowl into the freezer, pour the very cold whipping cream and whisk it with an electric beater. Careful not to over-beat past the holding peaks. 7. Gradually mix and fold the custard into the whipping cream until fully combined. NOTE: Here's where an ice-cream machine can be used. Otherwise, now place this mix into the freezer. 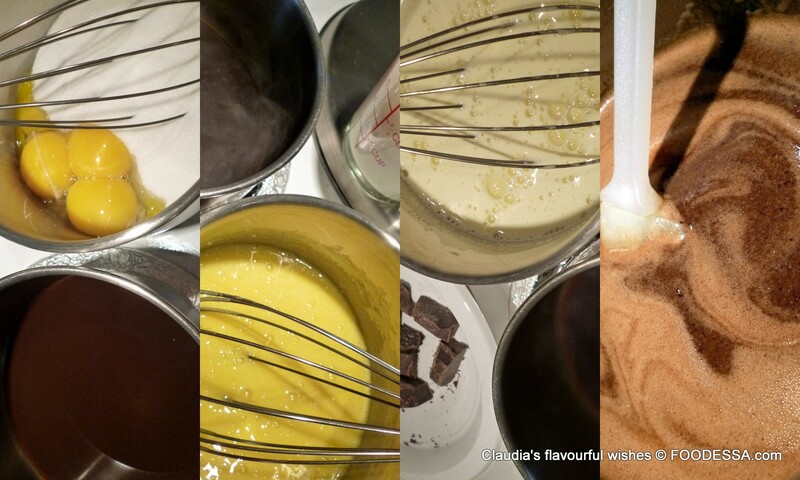 After the first hour, give the ice-cream custard a quick whisk to break up the initial forming crystals. Repeat the same twice more within the next few hours.
. This ice-cream remains creamy and very smooth...lusciously delicious to say the least. I'm also adding a low fat version which I've created over many trials and errors. Principal changes were made with evaporated milk and pure Espresso coffee. Please note that the instructions also differ from the original above recipe. Note: 1 can (370ml/1-1/2 cups) of evaporated milk will be needed. In a small saucepan, pour the espresso, and sugar together. Heat on MEDIUM-HIGH until the liquid reaches a gentle boil. Afterwards, lower the heat to MEDIUM-LOW and cook the syrup for 25 minutes. Remove it from the heat and set aside.
. In a small-medium saucepan, whisk together the egg yolks and sugar. Then, gradually whisk in the milk(s) to a smooth consistency. Set aside while coffee syrup is finishing.
. Later, cook the custard on LOW-MEDIUM heat while occasionally whisking for about 15 minutes or until a thickening begins (about 160F/72C). Close the heat and remove the pot. Then, immediately stir in the chopped chocolate until melted. Now, whisk in the coffee syrup. Set aside to cool. Transfer the custard into a medium, heat-proof bowl and cover it with a plastic wrap touching the surface and leaving a tiny opening. Leave it alone for 40 minutes before refrigerating it for a minimum of 4 hours to overnight is best. Afterwards, add the liquor into the custard and place it back into the fridge until ready to assemble. 4. Pour the remaining evaporated milk into a deep, large stainless steel bowl and place it into the freezer. Leave it undisturbed for 2 hours all depending on the freezer's strength. The center should not be completely frozen.
. Remove the bowl from the freezer. With an electrical whisk, whip the partially frozen milk until it holds its peak. Then, fold and whisk in the cold custard until combined. Note: Here's where an ice-cream machine can be used. Otherwise, place this mix (covered) preferably at the back of the freezer. After the first 30 minutes, give the ice-cream a quick whisk to break up the initial forming crystals. Freeze and repeat the whisking within the next 30 minutes. Freeze again for the last 30 minutes, then whisk and immediately pour the mix into a pre-chilled freezer proof container. Serve after a minimum of 6 hours. This particular gourmet-style frozen treat has already been made multiple times. Its delicacy has been raved about from every palate that had the pleasure to try it. didn't have these recipes in your ice-cream repertoire. Happy St. Patrick's day to all my friends.